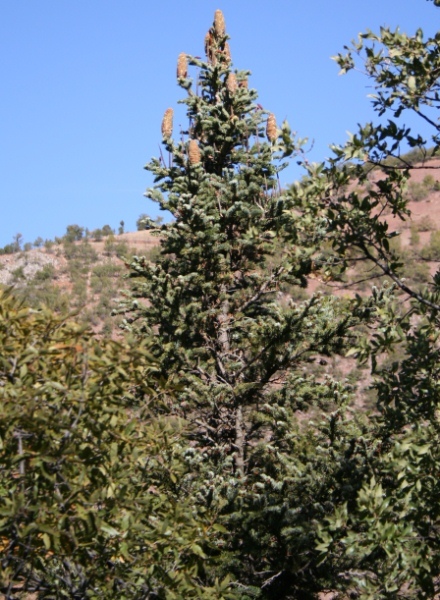 One of five species of firs native to Turkey where it has a restricted distribution in the Taurus Mountains. It is threatened by habitat degradation due to the effects of climate change, pathogen attack and fire. Tree to 30m tall, d.b.h. upto 1m; crown narrowly conical. Bark in old trees scaly and fissured. Branches spreading horizontally, the upper ascending, young shoots glabrous. Vegetative buds ovoid conical, acute, 3–4 x 2–3mm, resinous. Leaves spirally arranged, forward pointing, parted below the shoot, 25–40 x 1.5–1.8mm, twisted and abruptly narrowed at base, linear, flattened, bright green or glaucous above, greenish white with green midrib below; apex obtuse or slightly notched. Stomata in two broad bands below. Male pollen-cones lateral, axillary, 1–1.5cm long, yellowish with red microsporophylls. 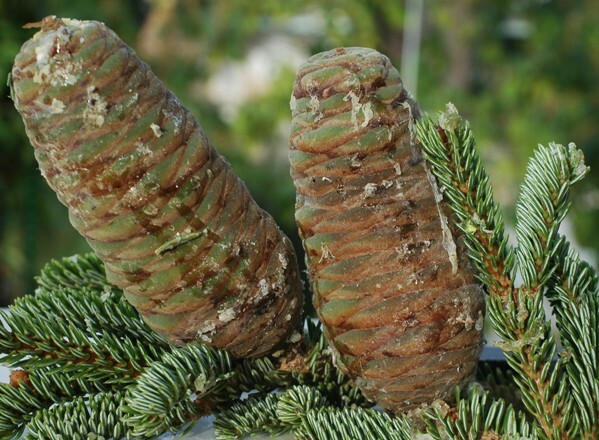 Female seed-cones lateral, erect, cylindrical, 16–20 x 4–6cm, greenish when immature, reddish brown and brown when mature, often resinous. Seed scales included (rarely exserted). Seeds obovate -triangular, 10–12 x 5mm, light brown; seed wings cuneate, light brown. The resinous vegetative buds and the glabrous young shoots distinguish this from A. cilicica subsp. cilicica. These minor and sometimes variable differences have led some to believe that these two taxa belong to the same species. This subspecies is endemic to south-west Turkey where it occurs in the provinces of Antalya and Konya in the Isaurian Taurus. It is estimated to occupy about 25% of the total range of Abies cilicica in Turkey and therefore the area of occupancy is estimated to be ca 850km². It has an altitudinal range of 1000–2000m (Davis, 1965) where it can form pure forests, but it mainly occurs in mixed forests, mostly with Cedrus libani and in association with Juniperus excelsa, J. oxycedrus, Populus tremula and Quercus libani. It favours calcareous substrates which are shallow, rocky and well drained. Abies cilicica subsp. isaurica has a limited distribution in the eastern Taurus Mountains with an estimated area of occupancy of 850km² which is within the 2000km² threshold for Vulnerable under criterion B2. It has a single location in the Isaurian Mountains where there is an increasing threat to the forests caused by the over-grazing by feral goats; this is particularly destructive to seedlings and young shoots and impeads regeneration (McGinley, 2008). The increase of tourists visiting the Taurus Mountains is also increasing the risk of fire. There have also been reports of sudden mortality (Carus, 2010) and a decline in the health of forests due to increased summer temperatures and reduced precipitation that has been attributed to global warming (Ozturk, 2010, pers. obs.). Some forests have a heavy infestatons of the parasitic mistletoe Viscum album subsp. abietis which has a debilitating effect on the trees. Atalay, I. & Efe R. (2010). Structural and distributional evaluation of forest ecosystems in Turkey. Journal of Environmental Biology. 31: 61-70. Bozkus, F. (1988). 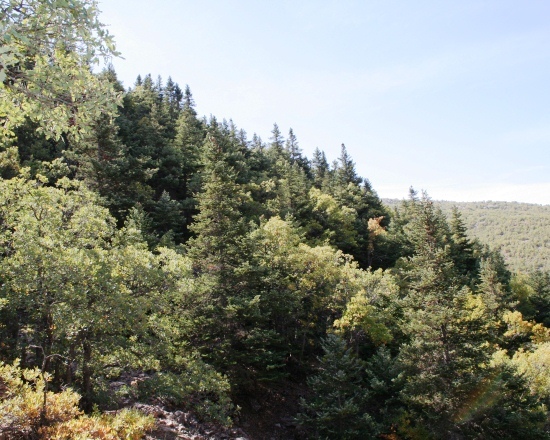 The Natural Distribution and Silvicultural Characteristics of Abies cilicica Carr. in Turkey. PhD Thesis. Istanbul University..
Browicz, K. (1982). Chorology of trees and shrubs in south-west Asia and adjacent regions. Polish Scientific Publishers, Warsawa. Carus, S. (2010). Pre-growth mortality of Abies cilicica trees and mortality models performance. Journal of Environmental Biology. 31: 363-368. Davis, P.H., Cullen, J. Coode, M.J.E. & Hedge I. C. (1965). Materials for the Flora of Turkey: X. Notes from the Royal Botanic Garden Edinburgh 26(2): 165-167. Davis, P.H. (ed). (1965-1985). Flora of Turkey and the East Aegean Islands. Edinburgh University Press, Edinburgh. Efe, R. (2005). Land Degradation in Taurus Mountains (Southern Turkey). European Geosciences Union, 2nd General Assembly, EGU-Geophysical Research Abstracts. 7:(00922). Gardner, M. & Knees, S. (2013). Abies cilicica ssp. isaurica. In: IUCN 2013. IUCN Red List of Threatened Species. Version 2013.1. . Downloaded on 07 July 2013. Ozturk, M., A. Celik, C. Yarci, A. Aksoy & Feoli, E. (2002). 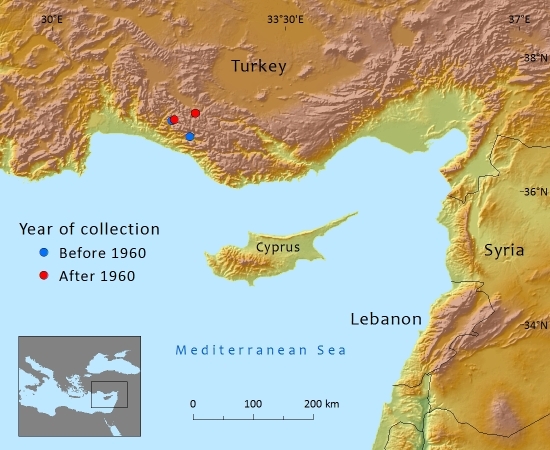 An overview of plant diversity, land use and degradation in the Mediterranean region of Turkey. Environmental Management and Health. 13(5) 442-449. Ozturk, M., Gucel, S., Kucuk, M. and Sakcali, S. (2010). Forest diversity, climate change and forest fires in the Mediterranean region of Turkey. Journal of Environmental Biology 31: 1-9. A. Çolak,S.G.Knees,and M.F.Gardner, 2013. Abies cilicica subsp. isaurica, from the website, Threatened Conifers of The World (http://threatenedconifers.rbge.org.uk/taxa/details/93).